If you’ve had enough of pulling all-nighters, then it’s time to learn how to create effective study plans and prioritise your work. I know what you’re probably thinking, “Ugh. Study plans”. It’s hard enough to actually sit down and study, let alone create a study plan, right? I used to think that study plans were something only super studious and organised students created (I was just winging it). 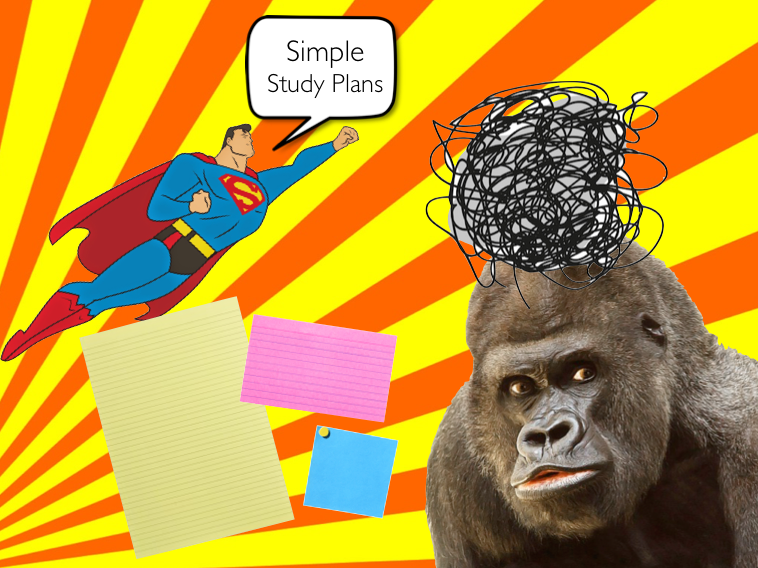 It wasn’t until I reached university that I discovered study plans are for everyone, especially for students who lack motivation, get easily distracted and feel incredibly lazy (that was me!). 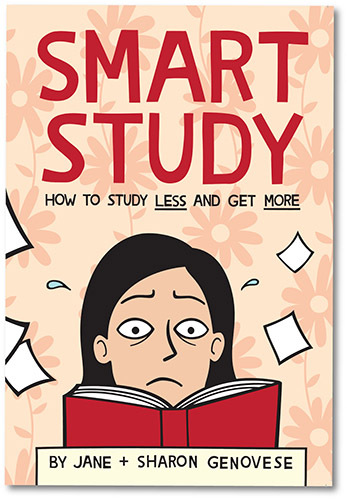 The great news is you don’t have to be a genius to create study plans that work. You can even create a study plan while watching Cat Videos on YouTube. It’s really that simple. 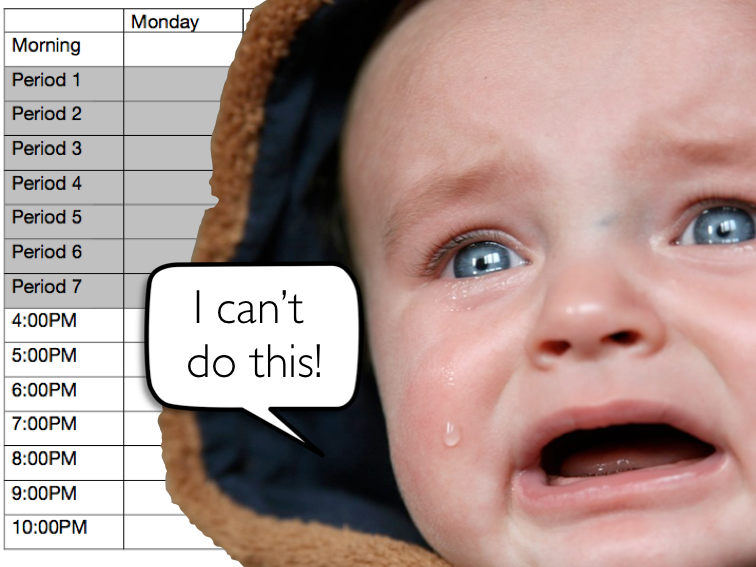 How not to get bogged down by your study plan. 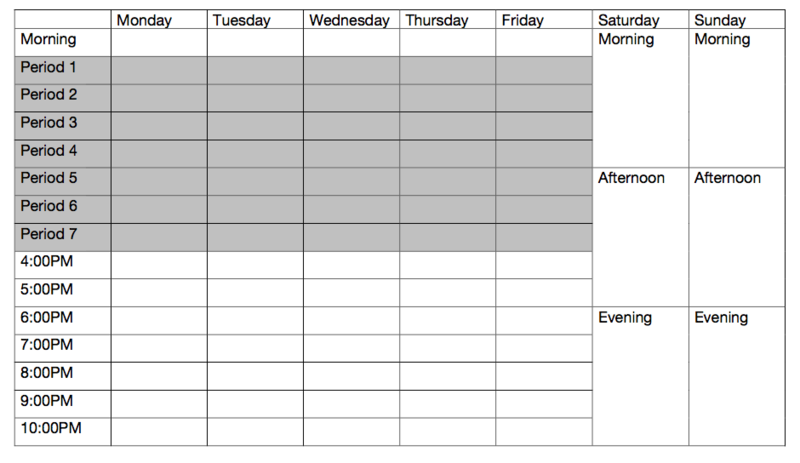 Why bother to create a study plan? Plans create structure in our lives. They can give us a routine to follow. 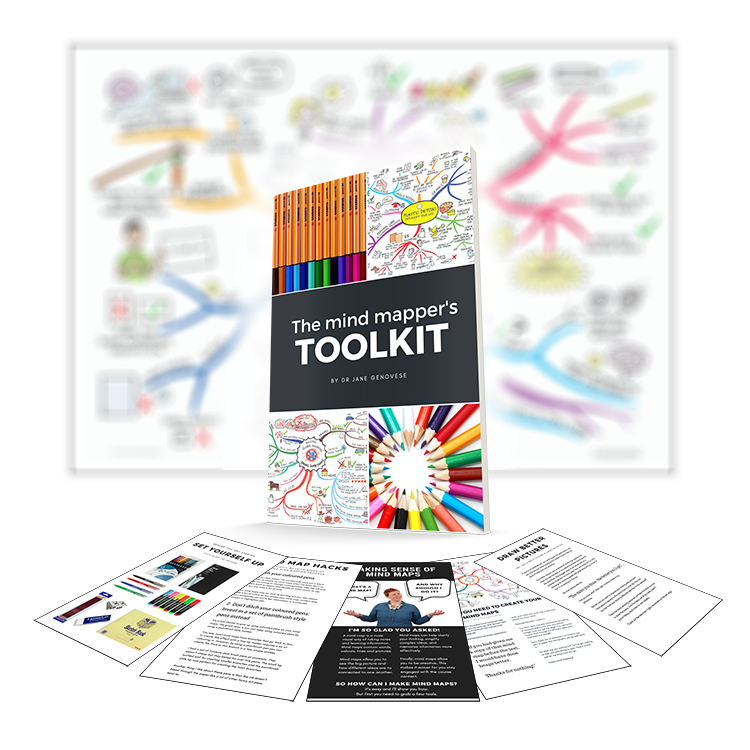 They can force you to think through all the steps of a project, to break things down and to consider when and where you’ll find time to carry out certain tasks. 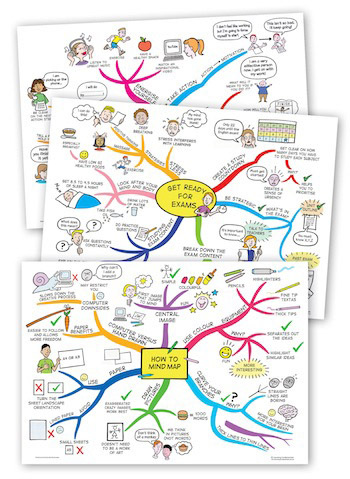 Many students report feeling more in control of their studies and less stressed and overwhelmed after creating a study plan. Have your teachers handed you a template that looked like this? Most likely they told you to fill it in with all your extra curricular activities (e.g. soccer practice, guitar lessons and Homework club). Then they would have told you to factor in some free time and schedule in your study time around that. If you’re like most students, you would have stuck at it for a few days before getting derailed and abandoning the schedule altogether. 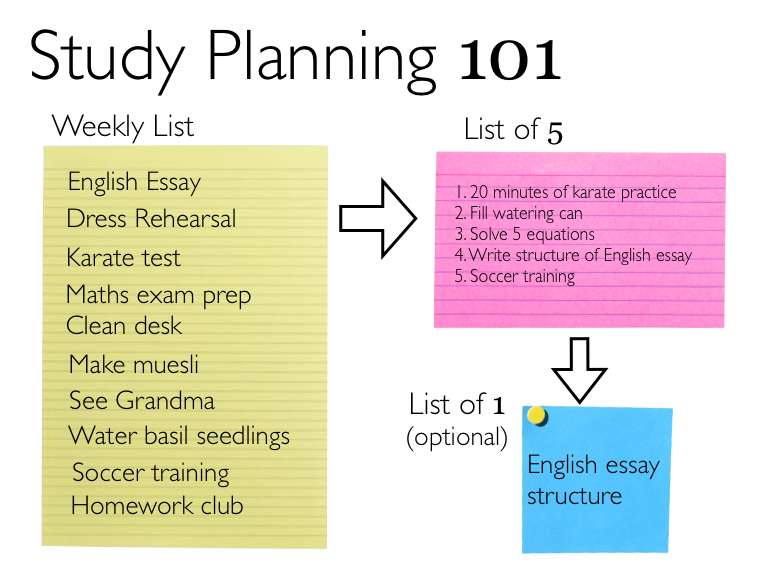 This study planning methods requires you to make several lists but don’t be put off by this. It takes me between 5-10 minutes to make my lists and I get that time back plus more as a result of creating the lists in the first place. So stay with me because this approach can be a game changer (it certainly was for me). You make this at the beginning of the week. 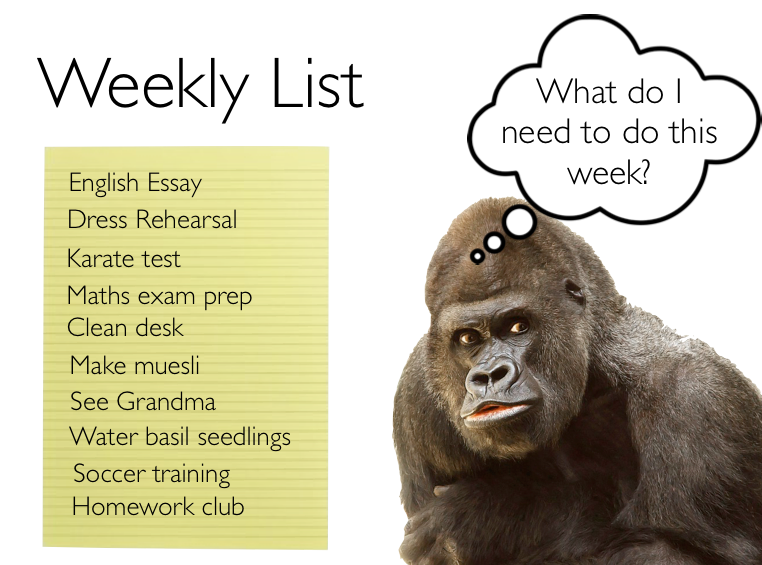 This list contains all the key tasks you need to perform for the week. Restrict this list to no more than 20 tasks (there’s only so much you can do in a week). For this list, I use a yellow notepad on a clipboard rather than any old sheet of lined paper. Why? It needs to stand out amongst all my other papers. But don’t stop here. A list of 20 is far too overwhelming for most of our brains. You need to break it down. Enter the list of five. Choose five important or urgent tasks from your weekly list. This is all you need to focus on today. Urgent: this task needs to be done right away. You can’t afford to faff around. There’s a deadline (e.g. it’s due tomorrow) so if you start tomorrow, it will be too late. Tim Ferriss has a clever strategy he uses to help him figure out the most important tasks for each day. He asks himself the question, “What are 3-5 things that are making me feel most anxious and uncomfortable?” You should probably try to knock these things off (unless there is a task with a more pressing deadline). I write my list of five out on a palm card. I put it in my pocket and regularly take it out to review it to make sure I’m on track throughout the day. What happens if you get distracted? Don’t beat yourself up. It’s super easy to get derailed. Just refocus on what you need to do. If you’re like me, a list of five is still far too overwhelming to look at. This is where the list of one can help. Look at your list of five and choose the most important and/or urgent task. Now write this task down on a post-it note. Put your list of five away in your pocket and place your list of one in front of you. If you have a whiteboard, write the task in big letters to help you stay focused. This task is all you need to worry about doing. Forget the rest until you’ve finished the task on your list of one. So if your list of five isn’t working for you or is looking a bit scrappy, create a new one! Once you’ve made your list you need to take action. The act of making the list will make you feel on top of everything but this can be a trap. Have you ever made a plan and then thought, “I’ve done enough for today. I’ll get started on this plan tomorrow”? If you have this thought after making a plan, alarm bells should be going off. You’re about to procrastinate! 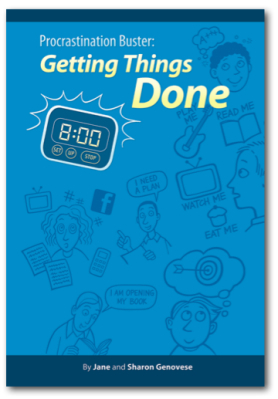 Remember, even with your list of five (or list of one), nothing will actually get done unless you take action. If an item on your list says, “Write essay”, this is way too vague for your brain. With vague goals, your brain says, “Meh. This isn’t important. I’ll do it tomorrow”. 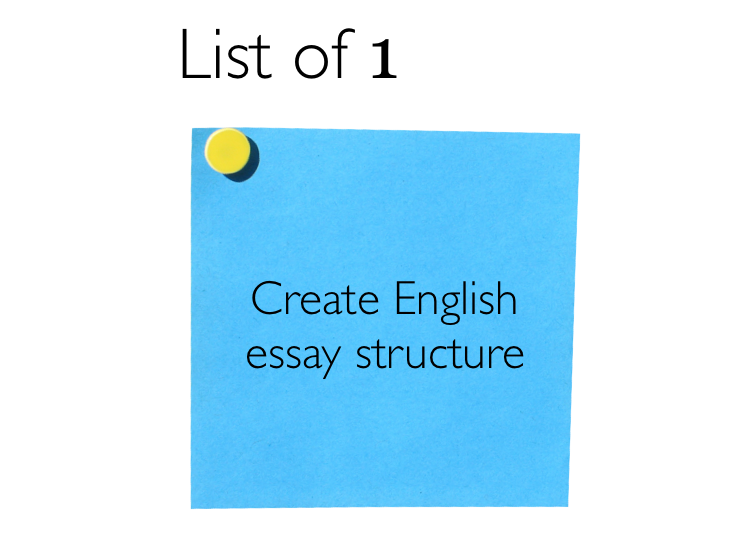 But if your list item says, “Create mind map structure of English essay”, your brain is more likely to think “This is important! Let’s get cracking!”. 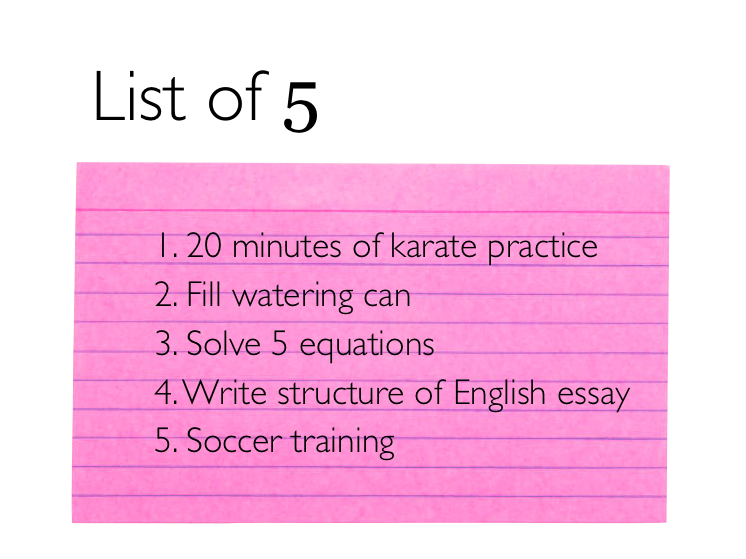 Can you think of five specific tasks you need to do today? Get the ball rolling by posting your list of five (or your list of one) below!